This super cool and trendy sneaker favor offers loads of cuteness! Certain to get 'ooohs' and 'aaahs' at baby showers, christenings, first birthdays and other adorable baby events! 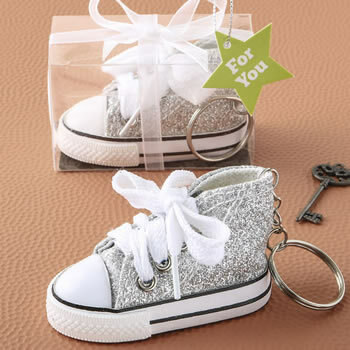 The sneaker is attached to a silver key chain and silver key ring. It comes packaged in a clear gift box, wrapped and tied with a white organza ribbon and bow. Attached to the bow is a lime star shaped 'For You' tag. I put a lot of thought into party favors, because they have to be affordable, but not tchotchke, and something that makes the person remember the event. You can't beat these little shoes for the price. I put a small Mickey Mouse charm on the key chain to tie it back to the theme of the shower and then tied a better bow around the box. OMG! Even my friends not attending the shower wanted one. It is the cutest thing you will ever see! Plan an event around this party favor and have fun giving them!